blocked to 7" x 68"
This is an extreme example of the yarn doing all the work. It is all garter stitch. The two yarns are a lighter and darker version of the same color which together made a medium. I knew in advance that the recipient strongly favored this color and texture. blocked to 5" x 55"
My first crochet project, featuring an easy lace stitch. 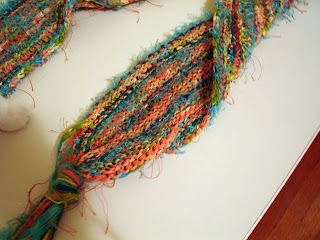 The result was good partly because the yarn was soft and pliable and the stitch was open work. 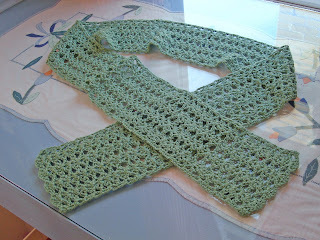 For the most part though, crochet is not as good as knitting for garments, leading to a fabric that is stiff and bulky. I learned crochet so that I could add edging to knitted garments. The scarf is small, and so is the recipient. This is a good color for her. blocked to 6.5" x 63"
The intent of this scarf was to have a friendly and folksy feeling as fitting the personality of the recipient. I don't know why exactly, but this design, especially in these soft colors, seemed to work. finished size 5" x 84"
This scarf was made for someone who loves bright colors. It took a litte while to get the right color mix. 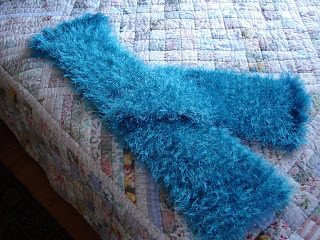 It was knit longways with about 250 stitches cast onto circular needles and then finished in just a few rows. 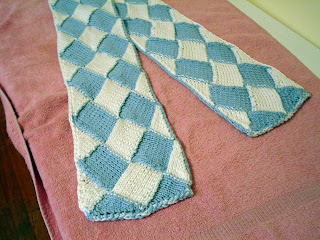 The pattern mixed knit and purl rows so that the color changes were visible on both sides, resulting in a reversible scarf. You are one talented lady! Your scarves are beautiful - and I love how you name them all. Cool!